When great friends in life and music collaborate, great things always happen and music wins! 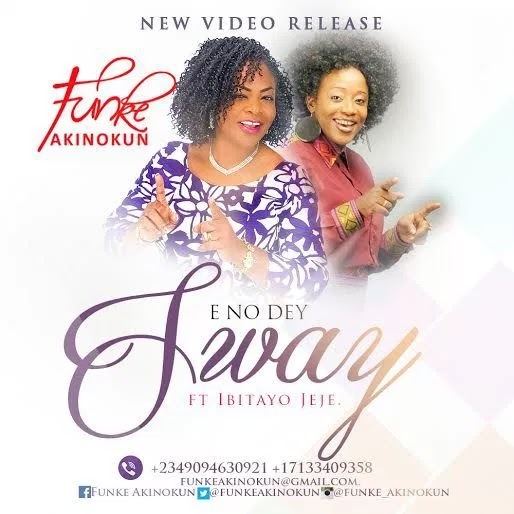 Funke Akinokun and Ibitayo Jeje are two of the most recognised female gospel artistes in Nigeria, and have finally found time to make the video for the amazing highlife-styled song titled E No Dey Sway, released worldwide,Tuesday, 10th of May, 2016. The song ‘E No Dey Sway’ written by Funke Akinokun, released in February 2016, was very well received, and exalts God by witnessing about His faithfulness, love, and consistency in our lives, in spite of our daily human inconsistencies and failings. The Video E No Dey Sway was shot by the talented Nigerian based Cinematographer Mr Oluyinka Davids of iFocus Pictures and his team (Ms. Lesley & Mr Chia Kisuh), on location in Dubai UAE, at the Jumeirah Golf Estate course, and the main business districts.